For customers looking to achieve a different look or color like a bronze window box or copper window box, the Medallion tapered Window box with Oil-Rubbed is just the product for you! This simple window box liner is durable with a polished finish that pairs nicely with the cage of the iron window planter. On top of impeccable style and charming window box, the Medallion Iron Window Planter is a durable metal cage that is easy to mount. Mounting screws are not included but can be purchased separately. The Medallion Window Box has been constructed out of steel and powder-coated to ensure many planting seasons. The design of this iron window planter features powder coated black bars crossing over one another diagonally with a catchy medallion detail marking where they meet in the middle. 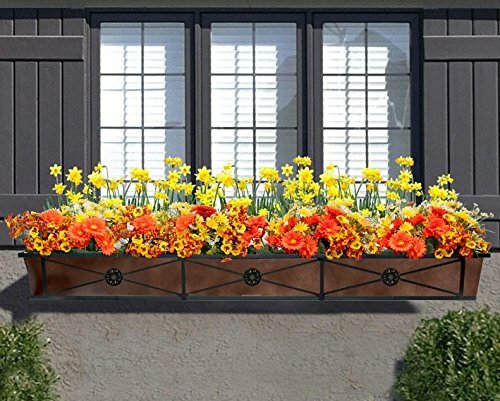 The 48" Medallion Window Box has two sets of cross bars, the 60" and 72" feature three sets of cross bars. The liner which is design to mimic an oil spill, beautifully contrast with the black bars against a backdrop of the colored liner. Pre-drilled integrated brackets make for a simple window box installation on most any surface. A variety of brackets for all deck rail sizes are also available (sold separately).